Another graduation card...this time a result of just playing around with colors of the rainbow. Kecia Waters on the blog on this Memorial Day. My AJVD stamp set "Congrats Grad" is truly getting a workout this month. To make this card, I stamped the graduation hat in different colors of pigment ink. I then sponged the sky. I did a little shading on the hats with Prismacolor pencils. The lines were drawn with a fine black marker. 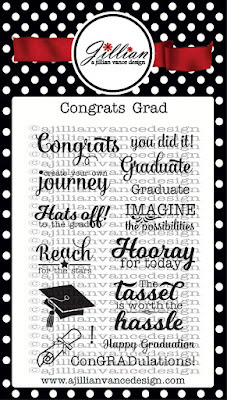 The sentiment, also from "Congrats Grad" was stamped with Versafine Onyx Black ink. I framed the scene with black cardstock and placed on a square white card panel. Have a wonderful week, AJVD fans! Thanks for stopping by the blog today! What a bright and happy card!!! This is the most awesome Grad card EVER Kecia.